I warned you… I told you I would get to 52, and to celebrate with the 52nd infographic of the year, I created one about these infographics with my awesome skills in Microsoft Paint. Enjoy, and thank you! What should I do as a weekly segment for 2014? Oh, and merry Christmas! That is if you celebrate it… Or, happy Festivus, Kwanzaa, Hanukkah, Holidays, or whatever it is you do. I hope it is a wonderfully good time! 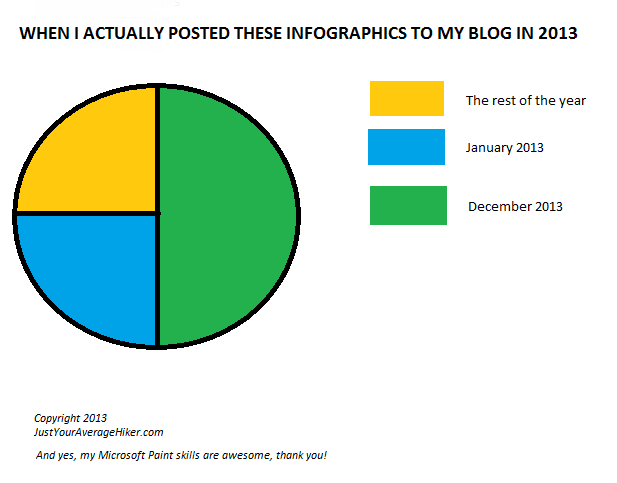 This entry was posted in General Nonsense, Infographic and tagged 2013, Infographic, Just Your Average Hiker, Microsoft Paint. Bookmark the permalink. Long time no see, when will you update your blog again?